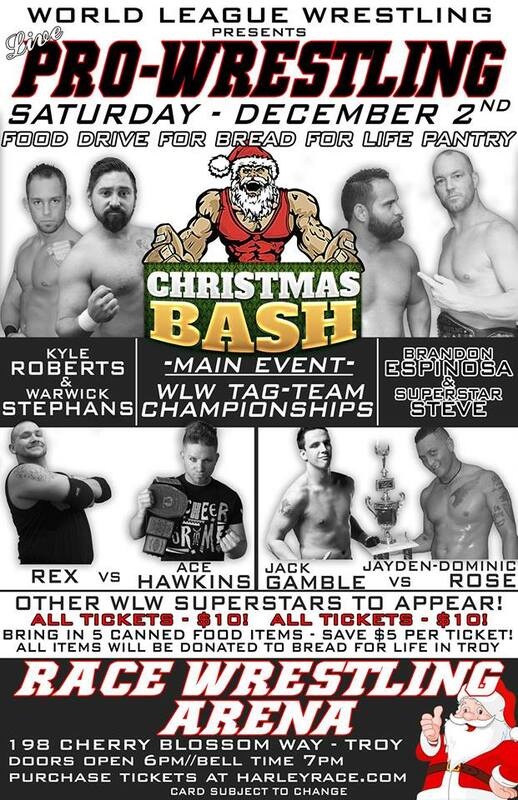 Harley Race’s World League Wrestling presents Christmas Bash 2017! The holidays are now upon us, and we are hosting one more event for the year! This event is being sponsored by C.T. Harrison Business Solutions, Ultimate Fitness Plus, Jim Trenary Ford, Impact Digital Designs. In the spirit of the holidays, we are raising both monetary and food donations for our local community food pantry – The Bread For Life Food Pantry – that helps those in need in our local community here in Lincoln County. The main event will feature a rematch for the WLW Tag-Team Championships as champions Superstar Steve and Brandon Espy Espinosa take on Warwick Stephans and Kyle Roberts! Other wrestlers scheduled to appear include Jaden Roller, Jon Webb, Jack Gamble, Leland Race, Rex – Wrestling, Ace Hawkins and more! All tickets are just $10, and if you bring in 5 or more canned food items – you will receive 50% off your tickets for that night’s event! During the event, fans will get to have their picture taken IN-RING with SANTA CLAUS! This entry was posted on November 15, 2017 at 5:40 pm	and is filed under Uncategorized. You can follow any responses to this entry through the RSS 2.0 feed. You can leave a response, or trackback from your own site.